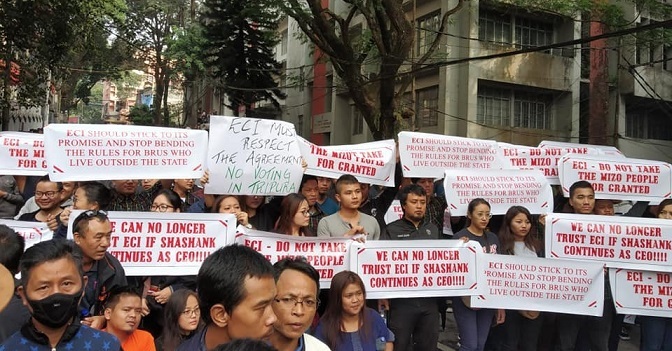 The widespread protests across Mizoram launched by vivil society organizations and students’ bodies demanding removal of State Chief Electoral Officer (CEO) S B Shashank were suspended on Wednesday even as the CEO left for New Delhi after being summoned by the Election Commission of India (ECI). The protests were called off at 1 pm after Shashank left Aizawl city for Lengpui airport. The agitation demanding the CEO’s removal was launched on Tuesday and resumed on Wednesday morning by a large number of Young Mizo Association members in front of the CEO’s office from 8 am. The organizations leading the protest informed that the agitation has been temporarily suspended till the ECI takes a decision regarding Shashank. The protestors demanded that 11,232 Bru voters presently lodged in six relief camps of Tripura be allowed to exercise their franchise at their respective polling stations in Mizoram and not in Tripura. It may be recalled that on Monday last, State Chief Minister Lal Thanhawla had written to Prime Minister Narendra Modi that ‘as people have lost faith in Shashank, the only solution for the smooth conduct of the Assembly elections scheduled for November 28 would be removal of S B Shashank from office forthwith’.